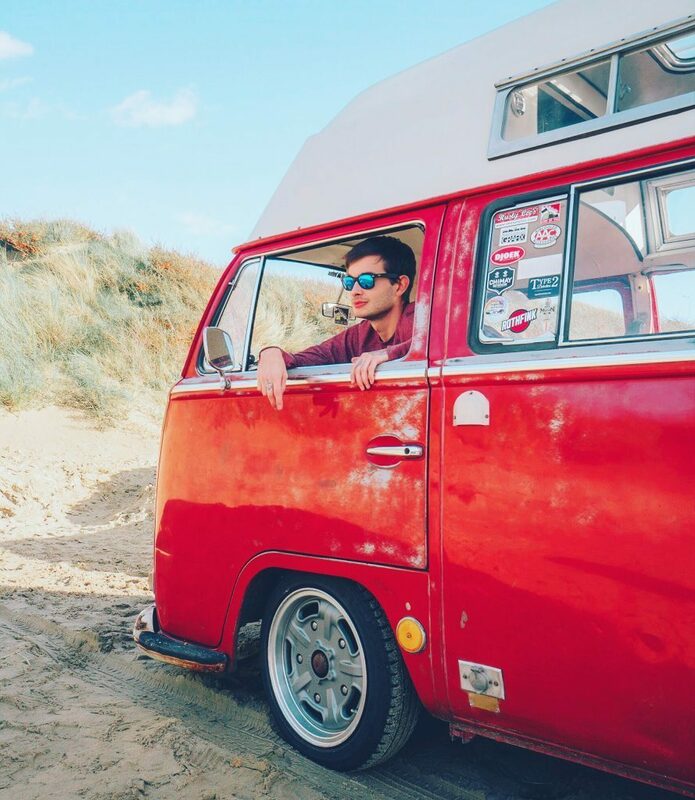 How to live the van life in style, that’s how I like to describe our lifestyle! It’s been three months since we picked up our 1969 VW Adventurewagen from an idyllic town in the Welsh countryside, and began living the van life. My oh my has it been a been a rollercoaster ride, with days we’ll never forget, and day’s we’d rather forget! David and I have been traveling the world full-time for five years, saying yes to new experiences and meeting a myriad of characters along the way, but as fun as our old lifestyle was, it was time for a change. Only one week after first entertaining the idea of van life – we bought a bus and jumped gung-ho into our new lifestyle – and it feels like we’ve finally found our perfect fit! Switching from brick and mortar to full-time van dwelling has come with a few surprises, so to mark our three-month van-niversary, I wanted to share the top ten things we wish we knew before we started on this van life adventure! Everyone always seems to “need” a bigger apartment or house, but I’ve always been a small living kinda girl, with dreams of owning my own tiny home starting way back when. But from day one, living off the grid has given us the perfect amount of space! When the place is a mess it takes ten minutes to clean, there’s plenty of room for both of us to hang out and work, and we have more storage than we know what to do with. I wish someone had told us how easy it would be to live this tiny; we would have done it years ago! When you travel by plane, you mainly see big cities, and on road trips, there’s a certain amount of organization that has to happen – which means stops are usually pre-planned. 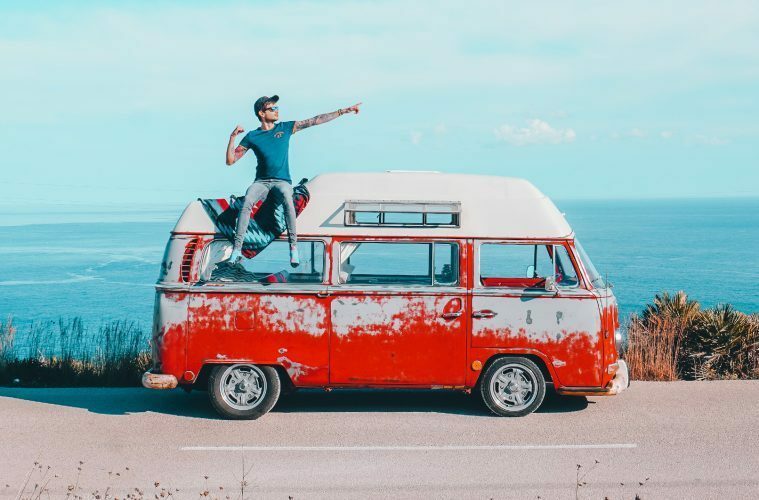 Since hitting the road in our VW T2, we seem to find ourselves getting caught up in almost endless unplanned adventures, from saving lost dogs, and discovering cliff-top camping spots, to making cupcake shop owning friends! 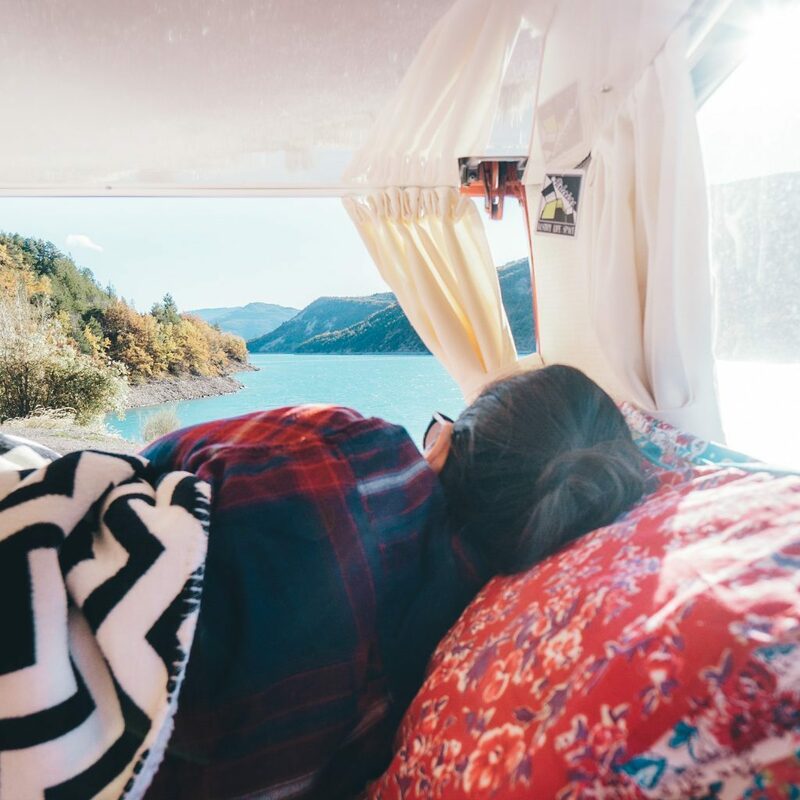 We heard tales of the joy of unplanned van life adventures, but to be honest, I thought that people might have been exaggerating to make their blog posts a bit juicier – turns out, it’s all true! When traveling full-time or on extended trips, it’s easy to miss your friends and family back home. You get used to it, but you still crave those nights when everyone comes over to watch really bad movies. 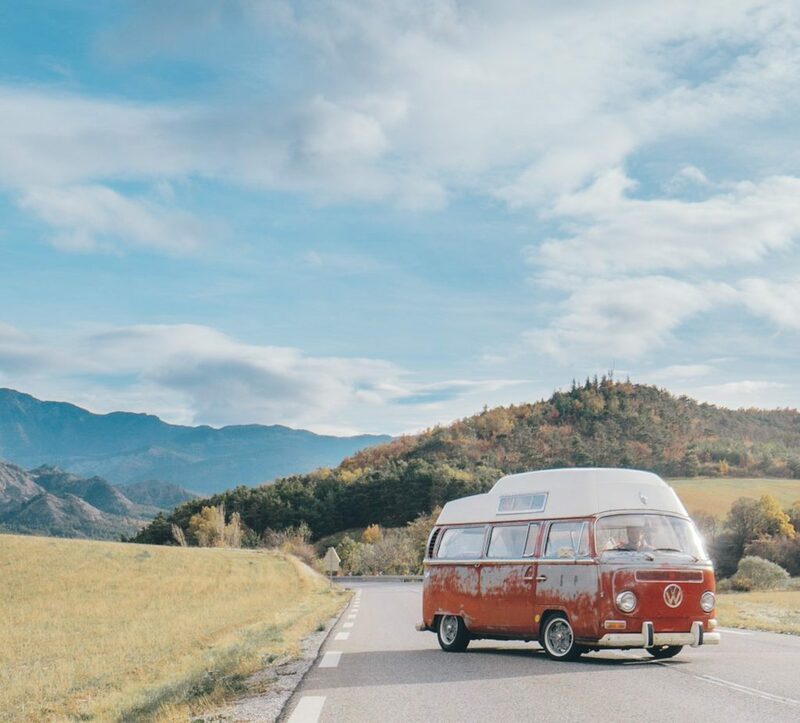 The community of fellow vandwellers is one of the most open, and welcoming that we’ve had the pleasure to stumble upon, and even more than just that – it’s so much easier to get chatting to locals because everyone wants to come over and ask about your bus! The process was really quick for us to go from deciding to live the van life to buying our bus, and I can’t tell you just how close we were to buying a split screen. As luck would have it, that fell through, and we happened to stumble upon @kustomlifespace on Instagram, and ended up buying their high top, Red, the 69 Adventurewagen. Only after picking Red up, and exploring some split screens did I realize how lucky it was that we accidentally bought a hightop. For me, and definitely for David (he’s tall), having the hightop makes living in the bus feel as comfortable as any “real” home, and honestly, I don’t know that I’d enjoy it anywhere near as much without. We are not the kind of people that can live the 9-5 life, we need to have the freedom to work, and adventure whenever the whim takes us. 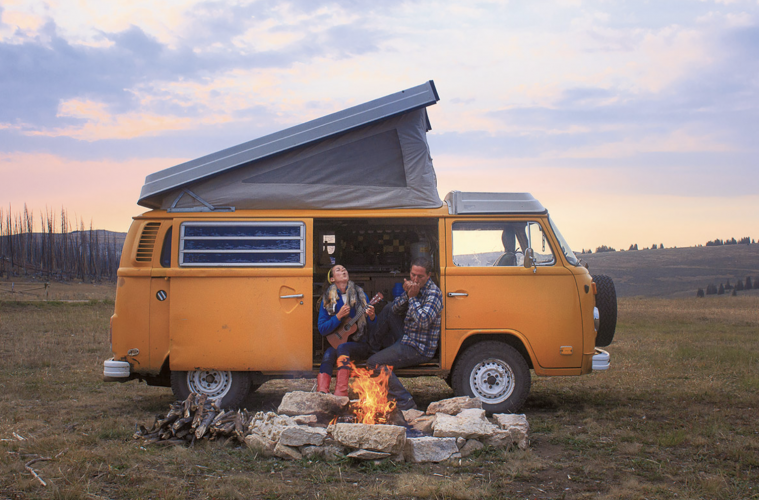 Before deciding that van life was right for us – we both agreed that it would only work if we followed the sunshine, that way, we could be out hiking, or on mountain bike adventures instead of stuck indoors feeling claustrophobic. But no matter how great your planning, rain happens, and sometimes it means that you’re stuck in the bus all day. It turns out; it’s mega cozy, and not in the slightest bit sucky! I love cooking, and the idea of a tiny kitchen with no oven, no smoothie maker, limited pantry space, a tiny fridge, and only one burner was perhaps the scariest part of van life for me. I knew it was survivable having been on many a wilderness camping trip, but I didn’t think that it would be that nutritious for us to live off of cowboy beans and three bean stew for the rest of our lives! But it has finally kicked our butts into being super organised about meal planning, and with limited pantry space we don’t just go to the store and buy whatever, so we’ve cut down on unhealthy snacks without even trying! If you’re looking for a must have addition to your van life essentials be sure to take a look at the Ridgemonkey Sandwich Toaster. Everyone focuses on how hard it is to downsize into a van, but for us – it was a huge upgrade. We had gone from owning what we could fit in our backpacks to being able to go on an Amazon shopping spree! We had room for everything we’d been missing out on, sports equipment, clothes that weren’t just “practical” and best of all – pretty home decor stuff. For the first two weeks, we had packages arriving every day, it felt like Christmas! Granted, most people probably will have to get rid of some clutter – but honestly, you will have enough space for everything you need! You don’t think about how much time your computer and phone takes to charge – and then how quickly the battery dies again; until you live the van life! We had a two-pronged approach to making sure that we’d always have enough power/everything charged, but we were sorely unprepared. The first part of our plan was to work from coffee shops, that way we could charge our computers and phones easily every day. Second, we bought a hella expensive lithium battery pack, our plan was to take this with us to coffee shops most days to charge it up for evening and weekend computer use. 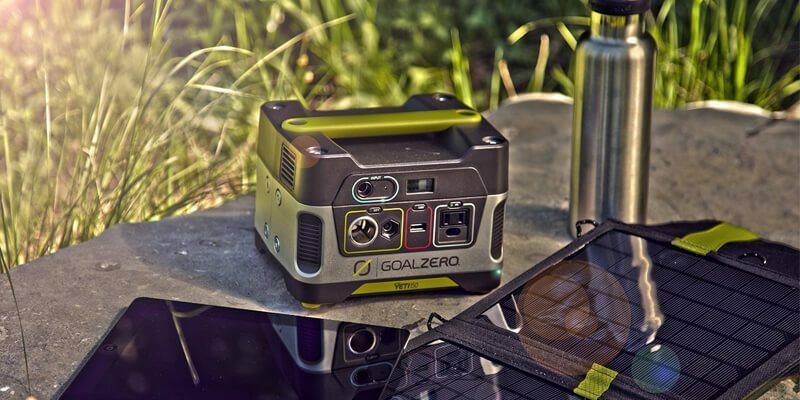 We bought the Goal Zero Yeti 400 after masses of research, but there were a few things we didn’t think take into consideration. Don’t get me wrong, we love our Goal Zero and wouldn’t want to live without it, but we had this stupid idea that it would be like having constant power like you would in a house. Pretty soon after hitting the road, I managed to get sick, I’m not talking about your run of the mill cold – nope, this was me throwing up non stop for days. And for us telling you how to live the van life, just be prepared for this to happen once or twice! This is the only time that I felt as though I didn’t want to be in the VW, and as luck would have it – we were visiting David’s Godmother’s at the time, so we did take a break from vanlife and stay in her guest house. It wouldn’t be impossible to be sick in the VW, but I would have felt bad for David having to be in there with a very sick me. In the age of apps, convenience is king, and it’s easy as pie to do just about anything, from ordering takeout and buying stuff online, to taking daily showers and watching Netflix, everything we want is instant and easy. But not so much for us anymore. We don’t have an address, so if we want to order something online, we either have to get it shipped to a friend’s house and then pick it up, or do without. Takeout doesn’t happen, I guess this is a good thing, but it doesn’t feel that way on a Friday night when you’re craving Thai food. Planning bathroom breaks, and finding showers does take thought and effort, and on a Sunday when you’re driving past closed shops, and can’t find a public restroom anywhere it can make you miss apartment life. And of course then there’s watching Netflix or TV – you always have to think about how much charge your computer has, and how much data you have left on your Mifi plan! One of the first things people think when they plan to take on the van life is usually “how do I keep clean?” or “how do I shower”, and from experience this is one of the least things you should be worrying about. It depends on where you are in the world, and what you’re doing. For example, we have travelled the east coast of Australia and we came across hundreds and hundreds of community toilets and showers, most of them being absolutely free. But on the other hand you could be driving through europe and you won’t see one for days. So, we have a solution, it’s called the Rinsekit, it’s a pressure shower in a portable tub. That doesn’t sound too appealing but it works, and it works well, trust us. Fill this beauty up at a standard water point, it will pressurise itself, and you’ll have a high pressure shower for up to 6 minutes. But is it warm I hear you ask? If you use a warm water spout then yes, if not, you can buy it’s additional heating rod, which will actually heat up the Rinsekit while you travel, so you can have a warm shower waiting for you when you arrive at camp.If that’s a little expensive then there’s plenty of portable showers on the market, take your pick, we recommend one that’s black so it attracts heat allowing you to warm it up on your campervan bonnet when it’s sunny. 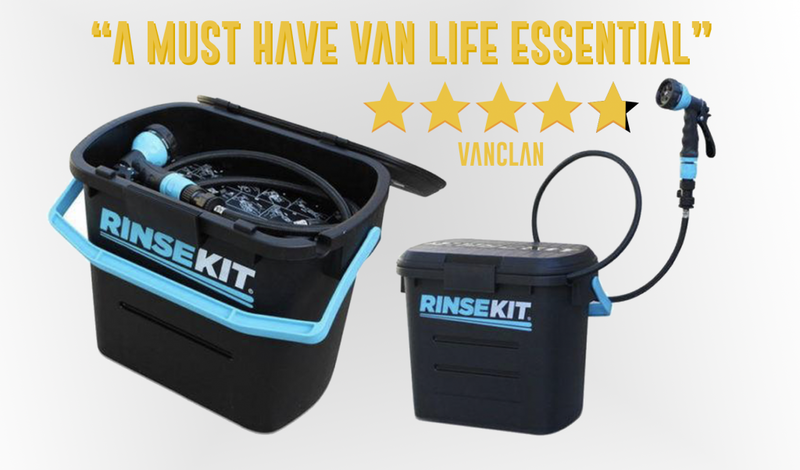 Oh, and you can clean dishes, surfboards and even your van life pet with the Rinsekit. It’s seriously worth picking up, we gave it a 4.8/5, yeah… we dig it. You might try hard not to spill on your clothes or to pretend that you don’t smell, but sooner or later you are going to have to ‘come clean’ to yourself and consider washing your van life clothing. If you’re travelling in a van then you will have no doubt come across washing machines in the carparks of Intermarche’s and other supermarkets that are kitted out for people living the van life, but they can be pretty expensive if you’re doing a large wash or freshening up your bedding. 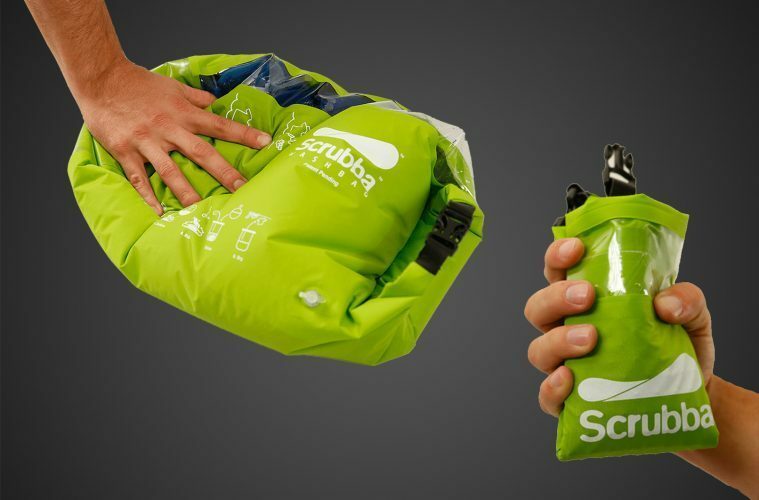 Get yourself a portable washing machine like the Scrubba Wash Bag and wash on the go. It’s basically a small bag with a washboard inside of it, but it’s super useful for washing underwear, t-shirts, jeans etc. As long as you have water, somewhere to hang your clothes and lots of elbow grease, then you can wash wherever you are without having to plug in. We’ve used it in warmer climates and are really pleased with the results, and our wallets still have plenty of Euros inside, so it must be working! Check out our review of the Scrubba Wash Bag here! You can’t just buy a van and set off into the unknown, especially if you’re travelling to different countries like we did around Europe. Bad things might happen, and although your van is insure, you might not be. Getting yourself insured is a must when you’re travelling into different countries. Laws change and the last thing you want is you or your partner getting in trouble when you’re in the middle of nowhere. So we recommend checking out Safety Wing, a insurance built specifically for the digital nomad. The SafetyWing van life insurance covers you in a couple of different ways – Travel Medical and Travel. Travel medical insurance opens the door to a global network of trusted and qualified hospitals and doctors that will help you with any sudden and unexpected medical problems or accidents that you might get on the road. With this van life insurance under your wing, you’ll be covered for costs with doctors, hospitals, and emergency medical evacuation. The dedicated Travel element of this insurance covers for travel delay and lost checked luggage if you’re using public transport or airports for your work, emergency response & natural disasters and personal liability. In short, your mother or father will sleep a lot more soundly in their beds at night if they knew that you were covered with SafetyWing van life insurance! 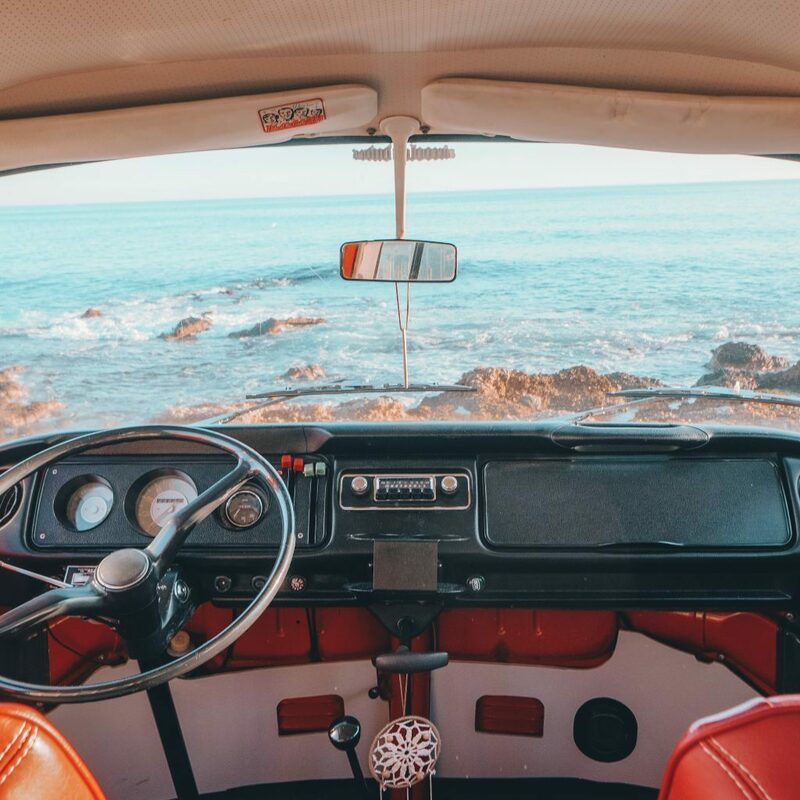 There are good and bad sides to every lifestyle, and even though there are some tough parts of vanlife, the majority of the time we love it and wouldn’t give it up for a free beach house in San Diego… well, maybe we’d go back and forth between the two! We love the freedom to get up and go, to take our home with us, and most of all to know that no matter what road we take, we’ll likely stumble into an unplanned adventure! So there you have it, our take on how to live the van life!